Thiruvananthapuram, the capital of the Indian state of Kerala is blessed with many natural tourist attractions. While considering the tourist destinations, beaches occupy a prime place. Trivandrum is lucky with the vicinity of a number of beautiful and clean beaches. This article lists the most popular beaches near Trivandrum city. Most popular beaches near Thiruvananthapuram city are at Kovalam, Poovar, Vizhinjam, Shanghumukham, and Varkala. This article will help you to pick the best beach to spent your evening during your visit to Trivandrum. Shankumugham is one of the nearest beaches from Trivandrum Central railway station. Have a look at the route map given below. It is just 8.7 km journey from Thiruvananthapuram central railway station to Shanghumukham beach. 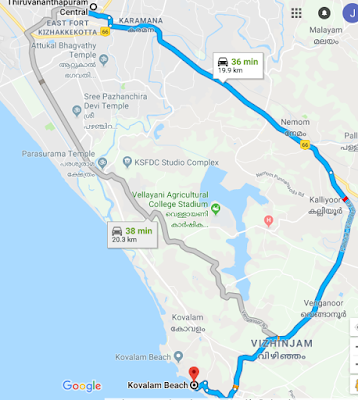 Thiruvananthapuram International Airport is 5 km away from Shanghumukham. One of the major attractions in Shankumugham Beach is a mermaid sculpture created by the Kanai Kunjiraman. It is one of the best beaches in Thiruvananthapuram to spent an evening with your family. Vizhinjam is 20 km away from Thiruvananthapuram central is an emerging seaport. Vizhinjam International Seaport is under the development by the Adani group under the Public-Private Partnership with the Government of Kerala. To view the route map to visit Vizhinjam, have a look at the picture given below. Vizhinjam has a reputation as a natural seaport more than a beach. However, a visit to Vizhinjam will give you a beautiful view of the cost. Once you reach Vizhinjam, do not forget to visit the famous Rock Cut Cave temple. Kovalam beach is one of the most popular beaches in India. Despite the popular belief, Kovalam beach is a combination of three beaches. They are Lighthouse Beach, Eve’s Beach, and Samudra Beach. It is situated 20 km from Thiruvananthapuram Central Railway Station. 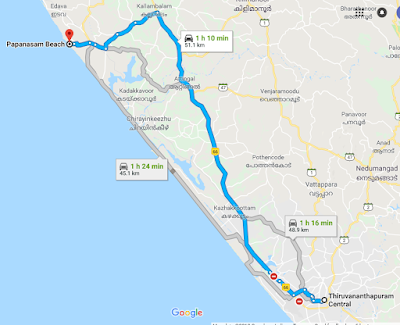 If you are planning to visit Kovalam beach from Thiruvananthapuram city, you can take the Thiruvananthapuram Kovalam highway. Many tourists prefer to spend multiple days here. You will not face any problems to find a stay here because of the presence of many hotels. You can choose a place to stay according to your budget. Varkala Papanasam Beach is one of the best places to hang out with your friends and family near Trivandrum. 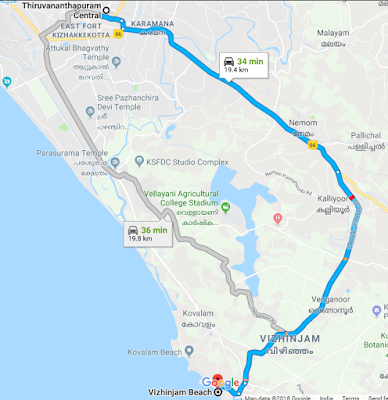 Though the distance between Varkala Papanasam beach and Thiruvananthapuram central is 50 km, a trip to there is worth a lot. The major attraction of Varkala beach from other beaches is the presence of a cliff adjacent to the sea. View of the beach from the cliff is very exotic. To visit Papanasam beach from Thiruvananthapuram, you can use either train or road transport. Though there are many small less popular beaches present in Thiruvananthapuram, the above four are the major center of attractions. Which is the Best Time to Visit Munnar Hill Station? We recommend you to visit these beaches whenever you are in Trivandrum. Varkala beach is the best in Kerala. Clean and greenish.